Happy Thursday, everyone! Happy Spring! Yes, there are actual signs of spring where I live, including ice out! This is HUGE! People are getting the boats ready to launch all over town. It's also time to get those rakes out to prepare the gardens and clean up the yards. It's so nice to be outside after a long winter trapped indoors! I made a card to enter in a couple challenges at The Outlawz. 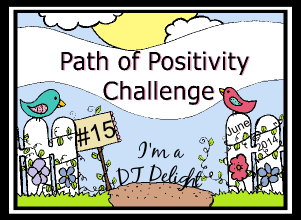 The image is this month's progressive freebie. She is from Oddball Art, and she is sassy! This is Oddball Art Sassy Big Eye Girl Sorry Sally image #205, and I am most appreciative of Lizzy Love for sponsoring The Outlawz this month! Sorry Sally was a joy to color with Copic markers, and she seemed just sassy enough to me to need a sassy saying to go with her. I computer generated that sentiment. The blue background brick paper is from We Are 3 Digital Shop. It is from the Brick Wall paper pack. Another challenge this month at the Outlawz, sponsored by We Are 3 Digital Shop, is the Crash Your Stash. The challenge is to use glitter. This is a huge challenge for me. I do NOT like glitter!!! It is way too messy for me! But, I broke some out, mixed it with texture paste, and used it on a brick wall stencil. I also used some glitter paints to add more dimension. I do believe that's a wrap for this card! I'm posting today for Kinda Cute by Patricia Alvarez. 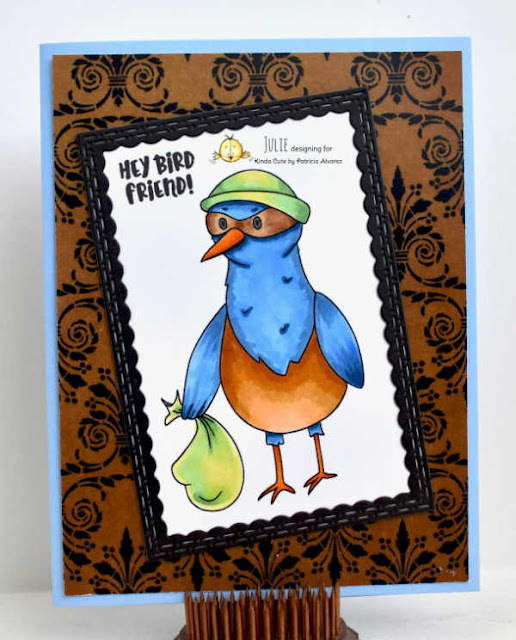 Patricia draws the cutest, most whimsical art, and I love to color it up and create cards with it. She has animals, fairies, dragons, monsters, snowmen, all kinds of adorable characters. It's definitely worth a trip to the Kinda Cute by Patricia Alvarez Store to see it all. He looks like a thief, with his mask on and his bag to hold all his treasures, doesn't he? I colored Magpie Thief with Copic markers, then used a frame die from Craftin' Desert Divas to frame him with. I found a challenge at The Outlawz for using damask, so I used this fleur de lis, or damask paper from Decosse's Dynamite Doodles as a background paper. 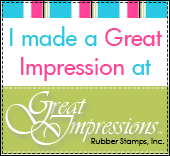 The sentiment is from Simon Says Stamp, and is an acrylic stamp. You can find my Kinda Cute inspiration in the Kinda Cute by Patricia Alvarez Facebook Group and on Instagram. 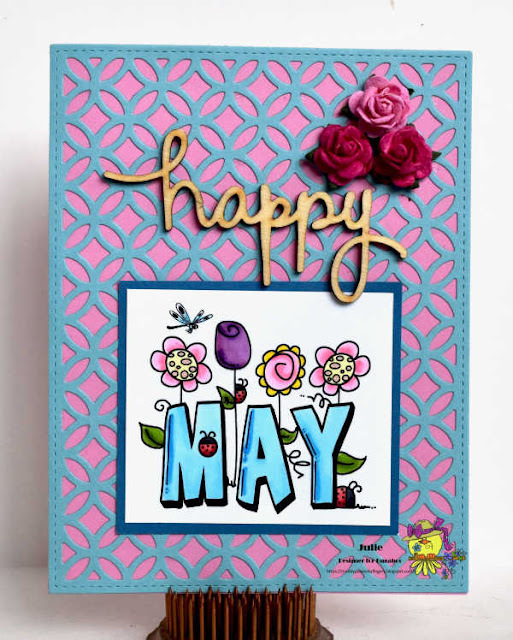 It's the 23rd of the month, so I'm on the Scribbles Designs Blog with some inspiration. Once a month, the 23rd is my day. 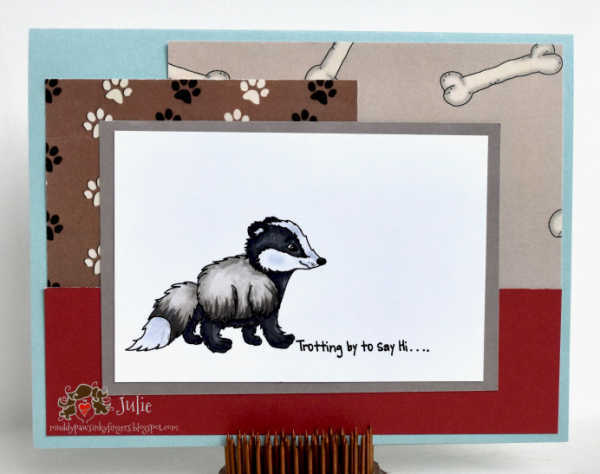 Today, a used a darling Badger digi to create with. I colored the Badger digi with Copic markers, and computer generated the sentiment. 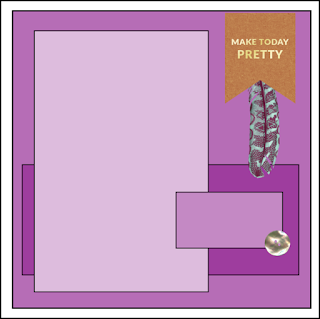 The papers on this card can also be purchased in the Scribbles Designs Store. You can find the Puppy Power papers here. You'll find many wonderful digis in the Scribbles Designs Store (including many free ones). 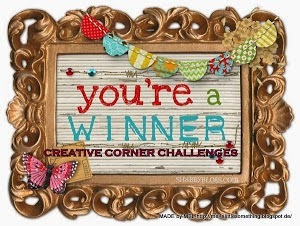 There are great challenges for you to join in on at the Scribbles Challenge Blog. I colored the May Word digi with Copic markers. I used a Lawn Fawn fancy lattice background card front, a wooden "happy" from my stash, and some mulberry paper flowers I picked up at Really Reasonable Ribbon. I think it makes a cheerful spring card. There are a thousand different ways you could color this May Word digi. It's 1/2 price for the week, so pick yours up, color it up, and enter it in the challenges at Catch the Bug. Win some more digis! You'll also want to check out what the other talented designers made with this digi on the Catch the Bug Blog. It'll give you great ideas on how to use it. 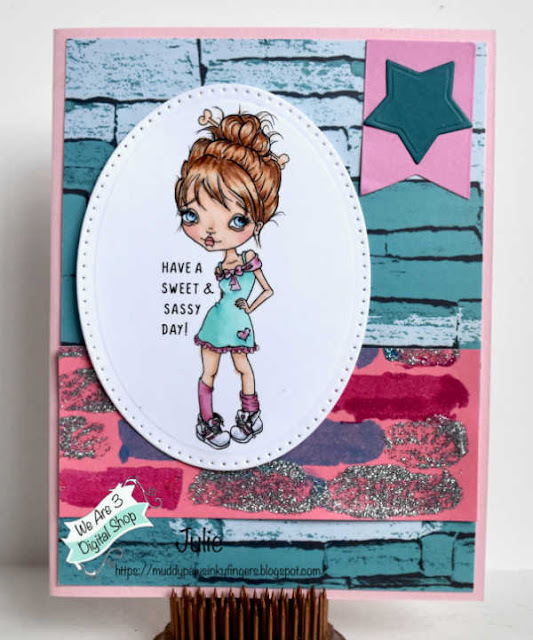 It's a day to showcase New Releases at All Dressed Up Stamps. There are 4 new releases in the All Dressed Up Etsy Shop this month, and they are being showcased in the All Dressed Up Facebook Group today. 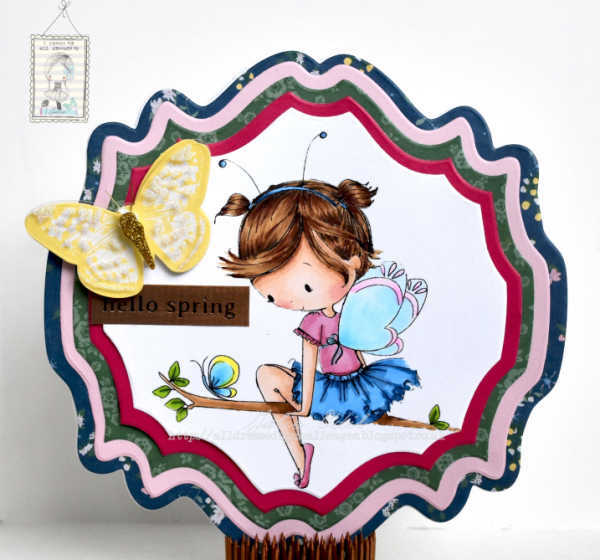 Little Butterfly Girl is looking like she is ushering in spring, isn't she? I colored Little Butterfly Girl with Copic markers. 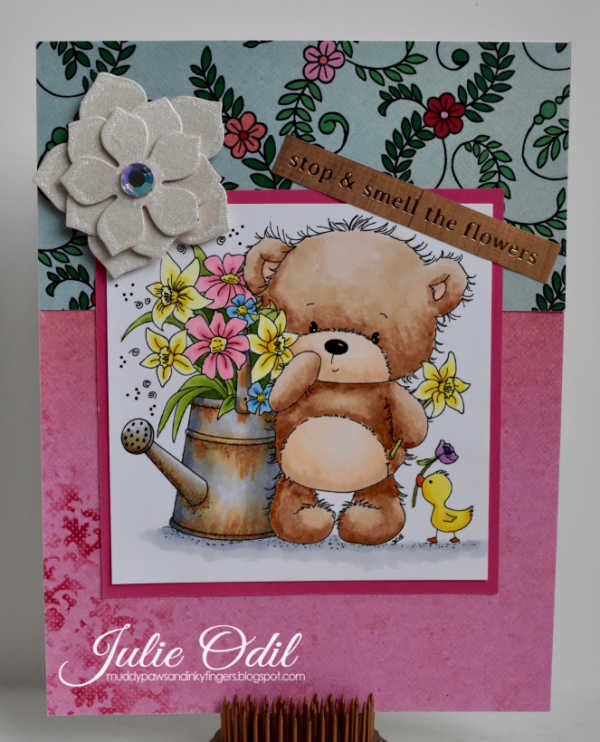 The card was constructed with a die from Yvonnes Creations, purchased in the Dies R Us Store. The papers and embellishments all came in a Spellbinders Papers Arts kit I purchased. Check out the All Dressed Up Facebook Group to see what the other designers made with New Release images. 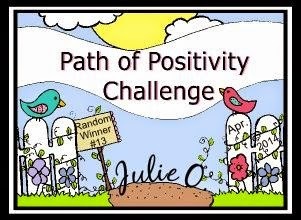 All check out this month's Animal-themed Challenge. Then, so some shopping in the All Dressed Up Shop, and join in the fun! 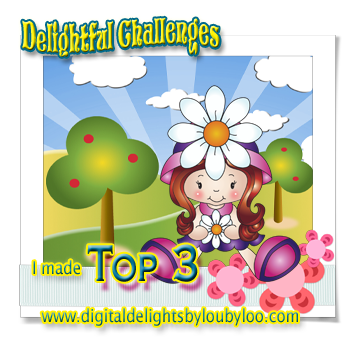 It's Saturday, and every other Saturday, a new challenge begins on the Di's Digi Designs Challenge Blog. 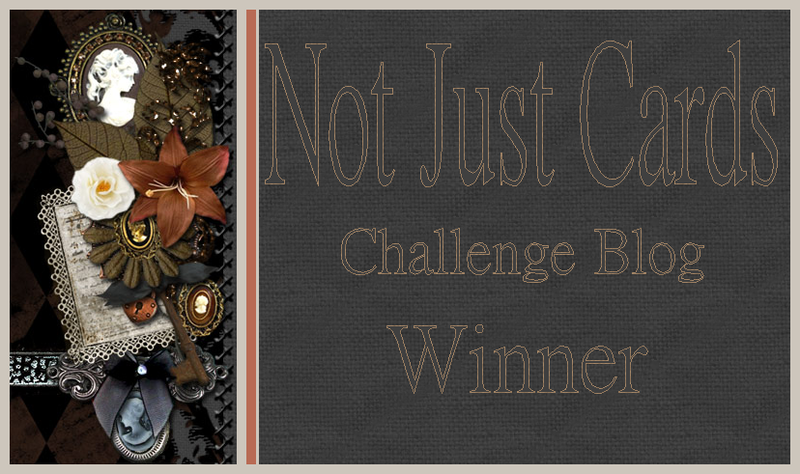 For the next 2 weeks, the challenge theme is 'Spring Flowers'. You will find many wonderful images, including many with spring flowers in the Di's Digistamps Shop. I colored Springtime Bear with Copic markers. The papers are digital, and I found them at Pixel Scrapper. All the embellishments were in a kit from Spellbinders Paper Arts. Springtime Bear -- you could win him or many other wonderful digis if you enter the spring flowers challenge this next 2 weeks at Di's Digi Designs Challenge Blog. I'd love to see what you create, so link up! It's the 3rd Wednesday of the month, and that means it's time for a new challenge at Scrapyland Challenge Blog. The challenges are always Anything Goes, as long as you use a die sold in the Scrapyland Store. There are 2 winners every challenge. 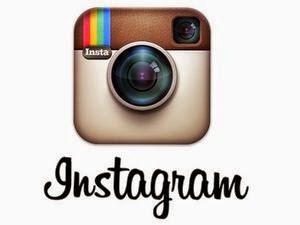 Each wins a $10 gift certificate to the Scrapyland Store! This uses the craft dies by Sue Wilson, Ornate Oval, My Friend. It is a 4 die set. I was worried about the words and gluing them down, but since they are all one piece, they are very easy to work with. Papers used on this card are by We Are 3 Digital Shop. I used papers from several different digital collections. The background paper is from the Peonies Ballet paper collection. 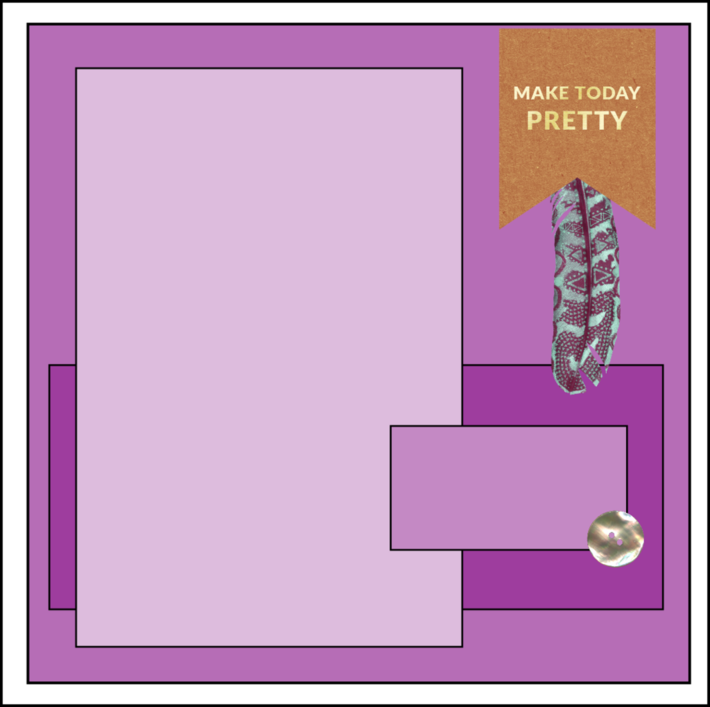 The ornate part of the oval (teal color) is part of the Sunny Days paper collection, and the light pink circle is from the Pinkalicious papers. Do you have a project where you used dies? See if it's in the Scrapyland Store, then link it to the Scrapyland challenge. 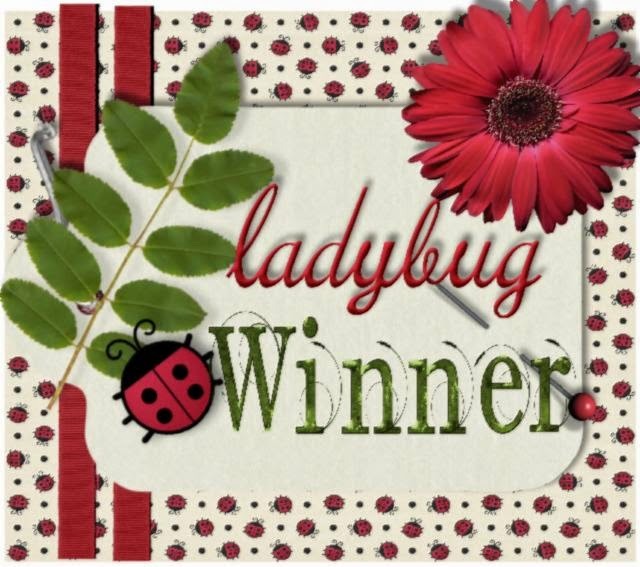 You might just win a $10 gift certificate, and I'd love to see your creation!